Electrical devices have become an essential part of modern life. In the cities, whether it is office buildings, schools, shopping malls, hospitals or hotels, all installed thousands of lights, air conditioners, ventilation fans and other facilities. We have realised that it is not a smart way to control and monitor a large number of devices and equipment by human. As a result, people started to study how to apply automation while optimizing the use of energy ― the result is the Building Automation System (BAS) or Building Management System (BMS). BAS is a centralized system that controls building’s lighting, air conditioning, ventilation and other equipment automatically in order to balance comfort and energy saving when using facilities. 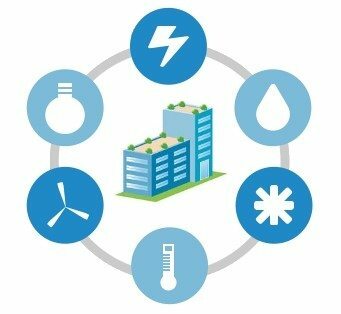 It can keep building climate within a specified range, control lights based on schedule, monitor performance and report to maintenance staff when a device fails. BAS is intended to create an intelligent building in order to reduce energy consumption and maintenance costs. Nowadays, most of the commercial and institutional buildings deploy BAS. Here’s a simple example shown in below diagram. 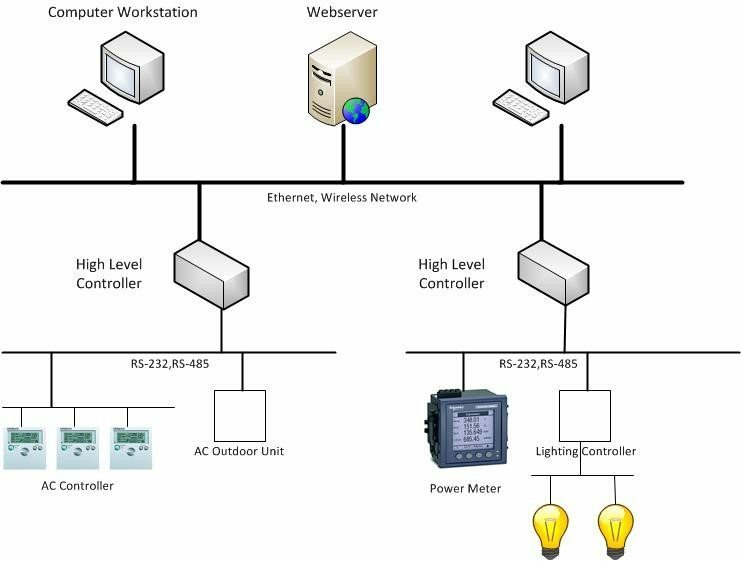 Different facilities have their own controller, called Low Level Controller, they are usually connected to a High Level Controller using wire (RS-232 or RS-485 standard). The Low Level Controller is used to provide direct control to the facilities. The High Level Controller gathers information from the Low Level Controllers, such as temperature and their running status, and commands the Low Level Controller to make required changes, for example, change the AC temperature to 25°c or turn on/off the lights. The communication method and format between the Low Level and High Level Controllers is based on general terms called Protocol. These protocols determine how devices talk to each other. At first, some manufacturers developed their own standard and protocol for the communication purpose on their own system. As a result, users had to choose a single manufacturer’s product for all systems to avoid incompatibility. Soon after, some manufacturers formed an alliance and used some published and open standard protocol for their products, so that their products can communicate with different brands and systems. Since the former way was not friendly to users, the open standard protocol became more popular and become the mainstream protocol. Three of the most widely used interoperability protocols are BACnet, LonTalk and Modbus, and they have been used for decades. Another function of the High Level Controller is to communicate with the computer workstation. High Level Controller can transform the facilities information into human-readable format for users to control and to monitor all the facilities though the GUI (Graphical User Interface). The advanced approach is to publish GUI to the internet through the web server so that users can remote control the system from anywhere they want. On our campus, BAS serves nearly all of the University’s buildings. Most of the air conditioners and lights in classrooms, hallways, offices and the power meters of buildings are integrated with BAS through our facility management network. The technical staff of FOM manage and monitor those devices through computer system remotely. Incidentally, since the hardware cost is greatly reduced with time, this model can also apply for residential use, we call it Home Automation or Smart Home. Many household appliances contain the high level controller and can directly connect to the network. This trend is expected to continue in the future.